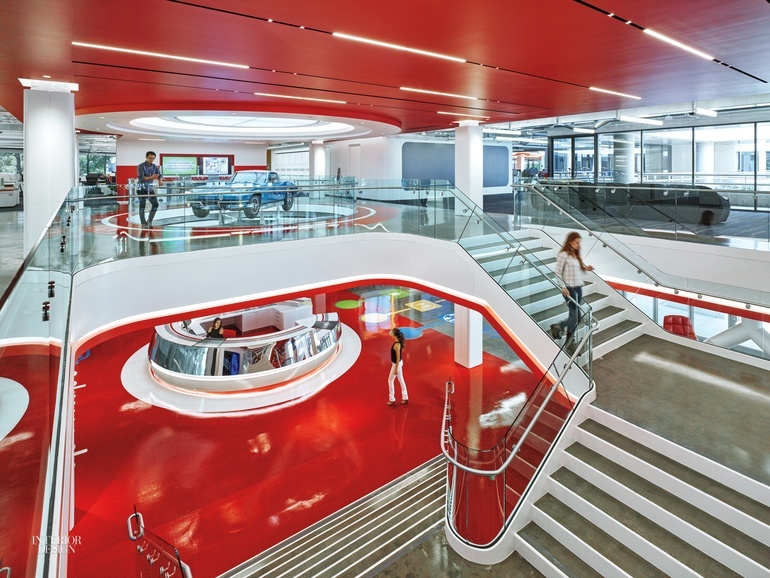 These spectacular office lobbies, masterpieces in their own right, offer a preliminary taste of the workplace wonder that unfolds inside. 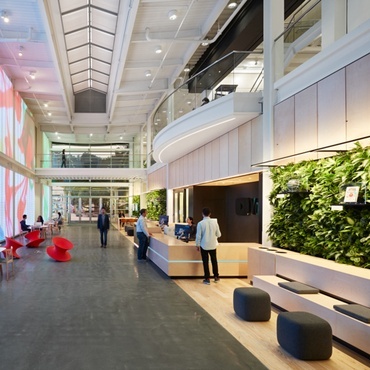 For more inspiration, check out our office spaces board on Pinterest. 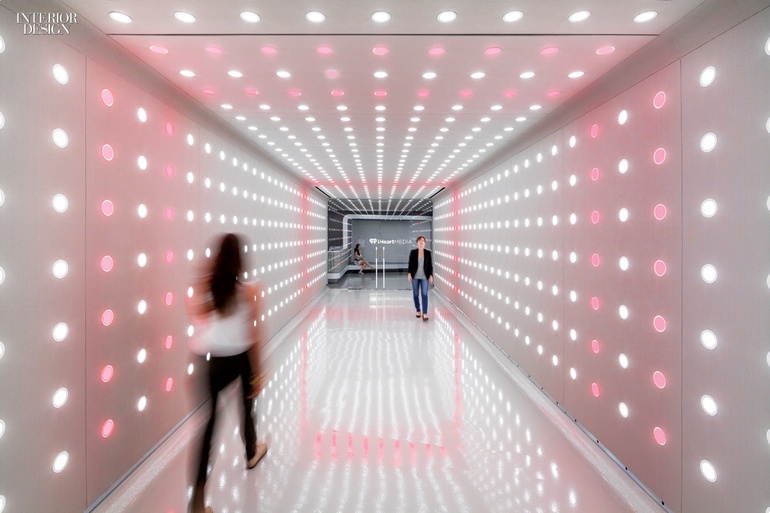 The bold Los Angeles headquarters of car data provider Edmunds.com can best be described as a visual tour de force by M+M Creative Studio. 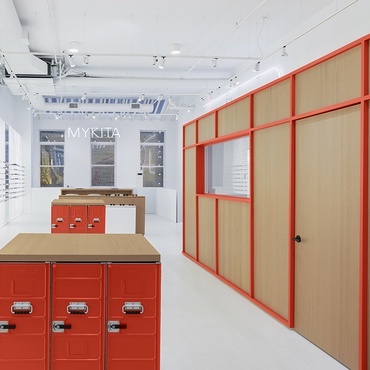 In reception, the desk’s mirror-polished stainless steel nods to the chrome bumpers on old Cadillacs. 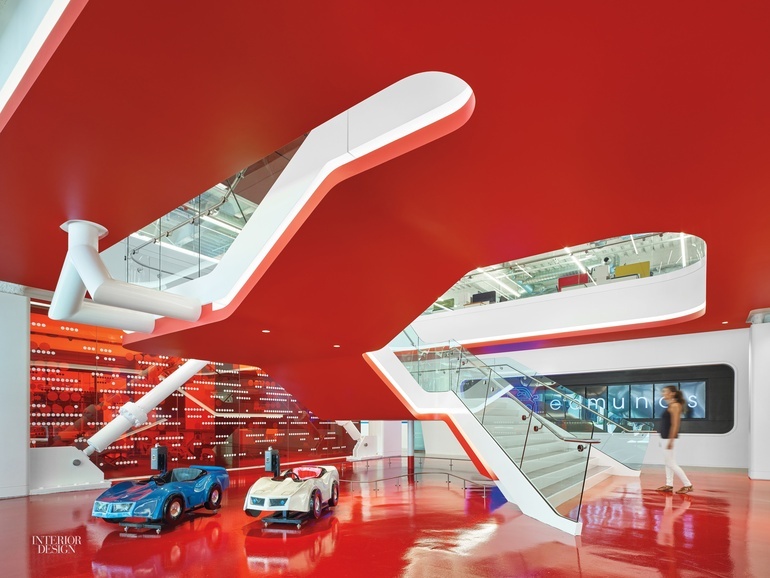 Visitors look up to see a 2016 Corvette Stingray convertible, gleaming in silver with a crimson leather interior, mounted upside down on a turntable set into a huge round cutout in the ceiling. Perched underneath the staircase are two more Stingrays, this time miniature and coin-operated. 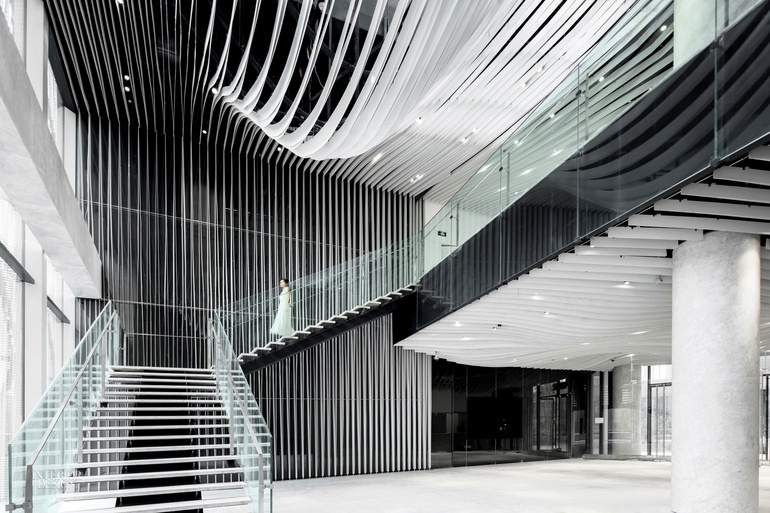 Respite from hectic urban bustle dictated Kengo Kuma’s design for the lobby at a mixed-use building in Shanghai. Louvers made of thin, flexible sheet aluminum, powder-coated white, undulate across the ceiling and down a wall—just like rippling waves. Another wall is pale gray marble with veining that echoes the wave pattern, polished to “soften the spatial atmosphere,” says Kuma. 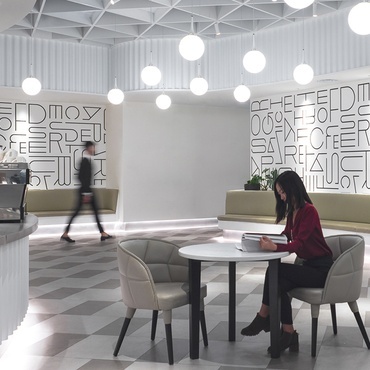 The entire ground level of real estate agency Douglas Elliman’s latest office is a grand entrance to the Los Angeles scene—thanks to Patrick Tighe Architecture. 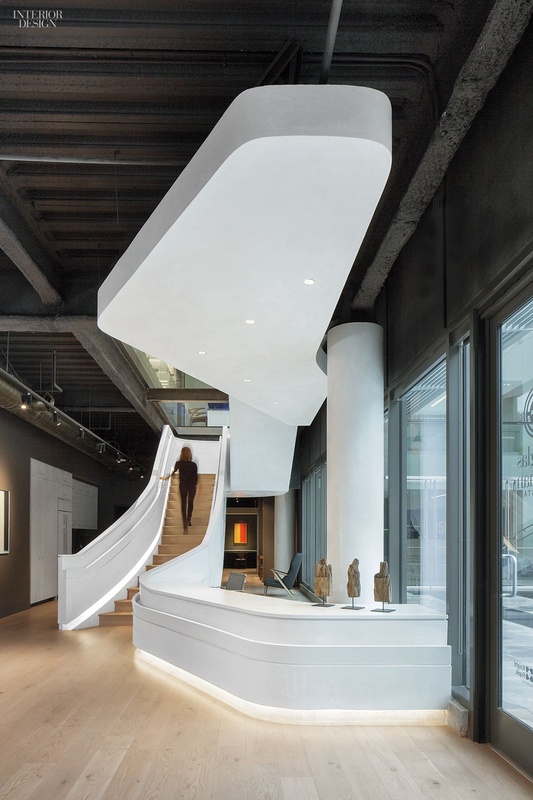 The “wow” moment, a spectacular stairway entirely of Tighe’s invention, is a ribbon of flawless white plaster that actually starts out as the front of the solid-surface reception desk, swooping upward to become a balustrade. 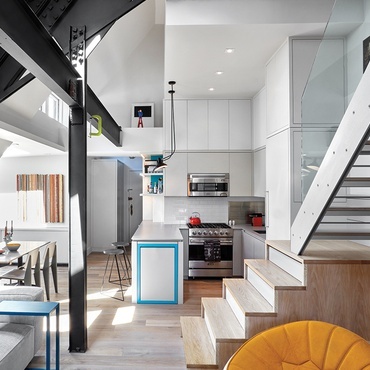 A continuous cove of LEDs—similar to the recessed lighting in the canopy—illuminates the gray-stained oak steps. 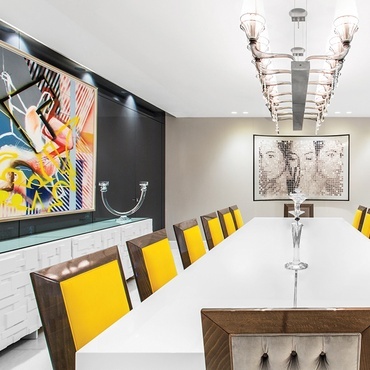 Ippolito Fleitz Group managed to bring high-style oomph with a touch of whimsy to a 1990’s office tower that epitomized the clean-cut Frankfurt look. In the lobby, white fins protrude from the walls in slightly different depths to create a mesmerizing, undulating visual effect. 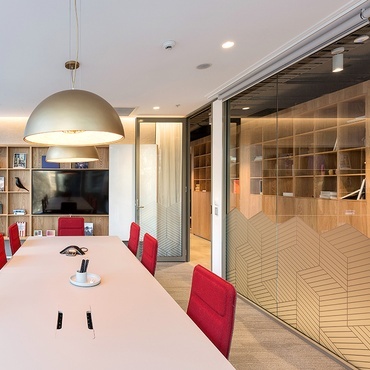 Tucked in between is a soundproofing system that reduces background noise, a common drawback to lobbies with lots of foot traffic. 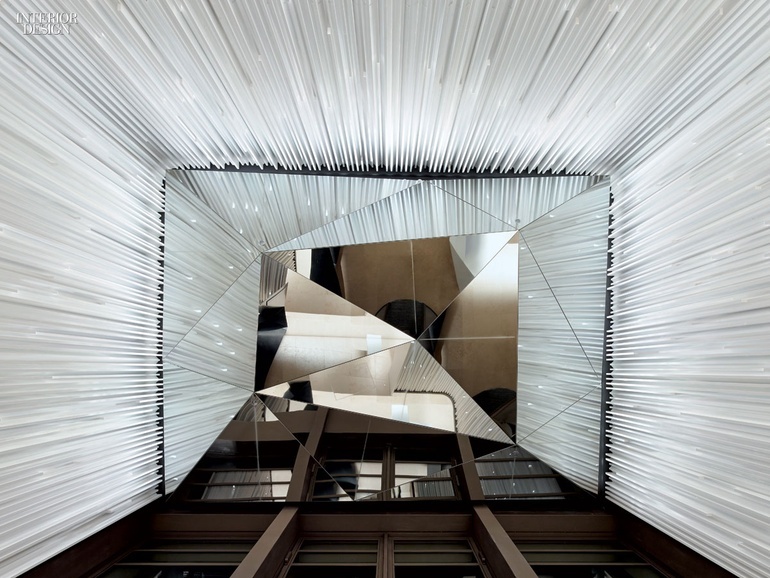 Overhead, the firm installed a composition of mirrored triangles that create kaleidoscopic reflections. 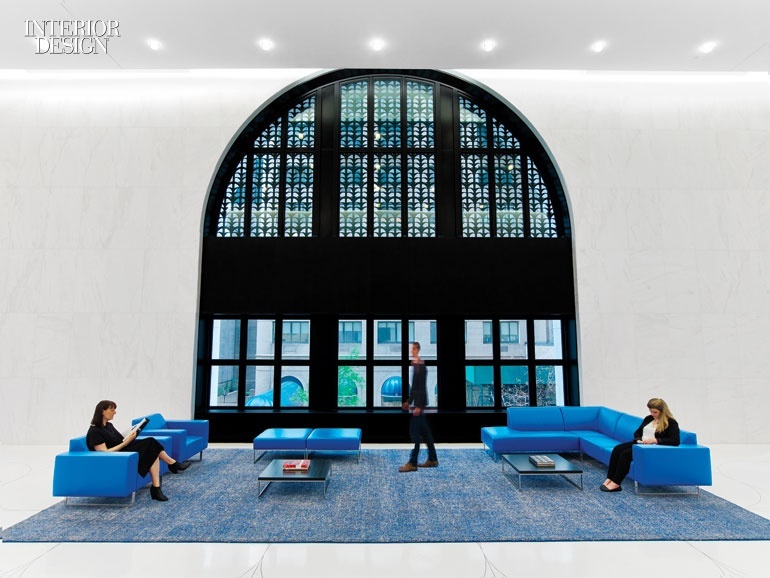 After rebranding Philip Johnson’s iconic Sony building and selling it to a real-estate developer, Sony enlisted Studios Architecture to guide the search for a new Manhattan headquarters. 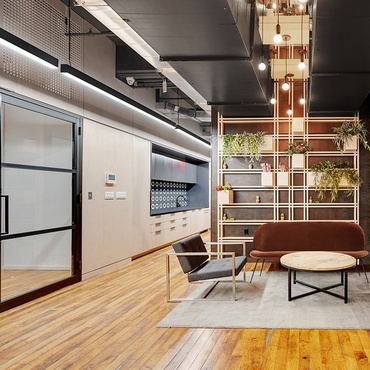 The firm’s answer fit the bill—the tech giant’s new outpost occupies 570,000 square feet across 10 levels at the top of an Art Deco landmark a few blocks downtown. 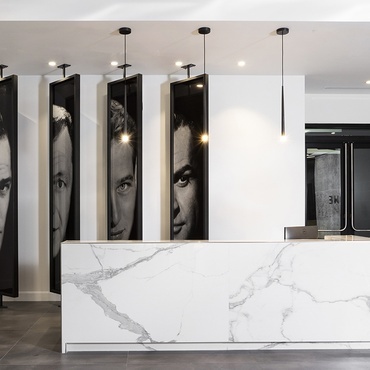 Gleaming in white marble and terrazzo, the lobby’s furnishings are intentionally spare, but for added effect, bass reverberates across the lobby as music videos pulse across an LED billboard. 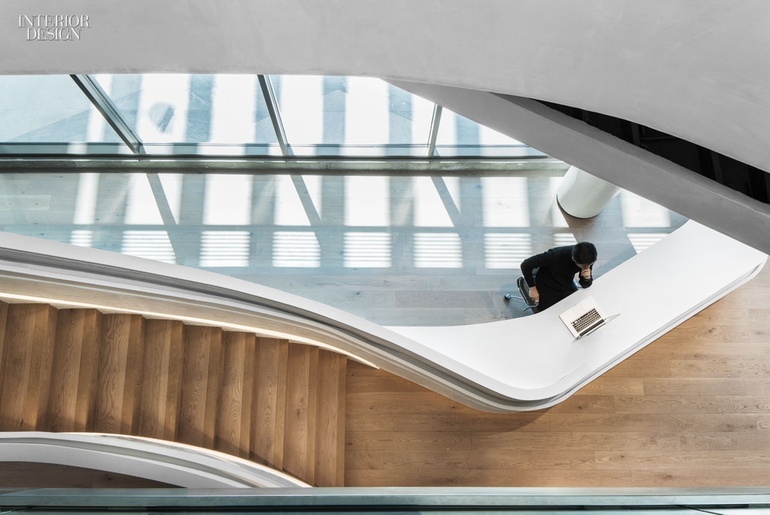 Metals giant Maike Group received a brand-new headquarters in Shaanxi by Hallucinate Design Group and Interdesign Associates across two buildings and a staggering 3.5 million square feet. 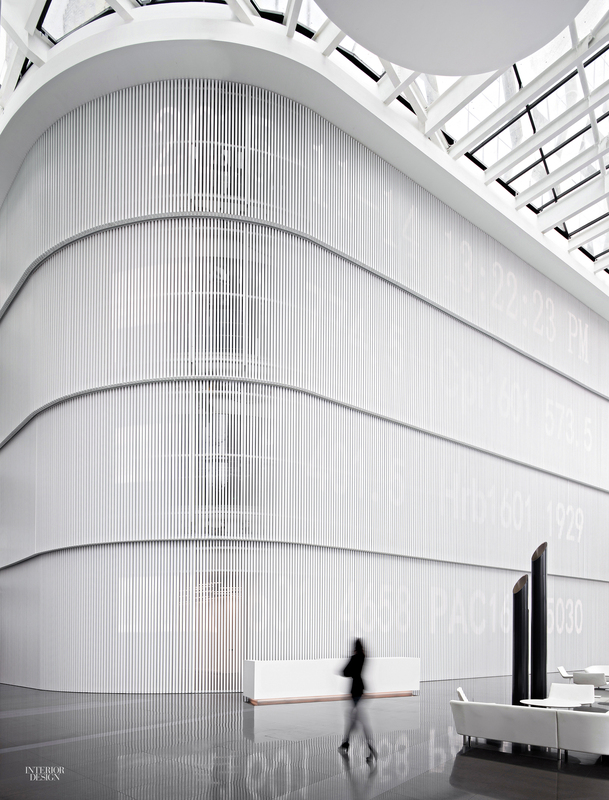 The lobby features a towering enclosure that presents a surface of white-slatted horizontal bands on which ghostly white numbers marquee across. 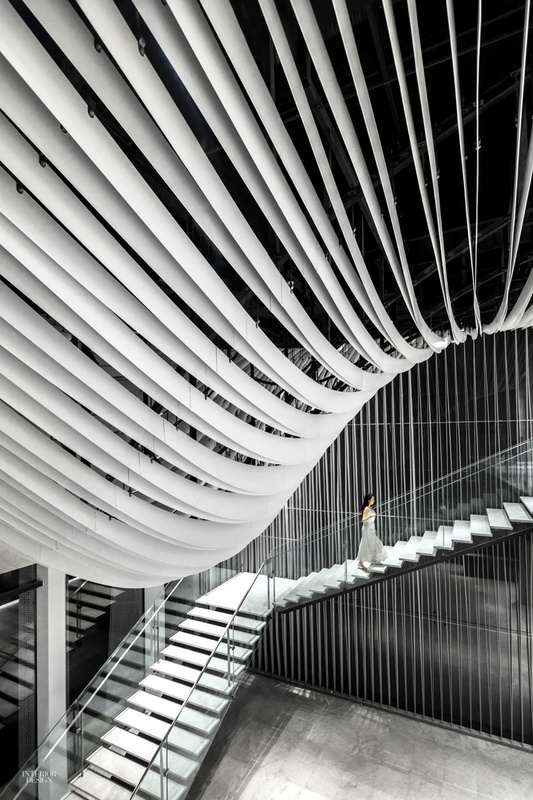 In contrast to the architecture’s dramatic scale, however, Hallucinate’s creative director Wang Weliang exercised reserve when it came to the color scheme—black and white, dominated by white—with sleek colorless furnishings perched on quartz composite flooring. 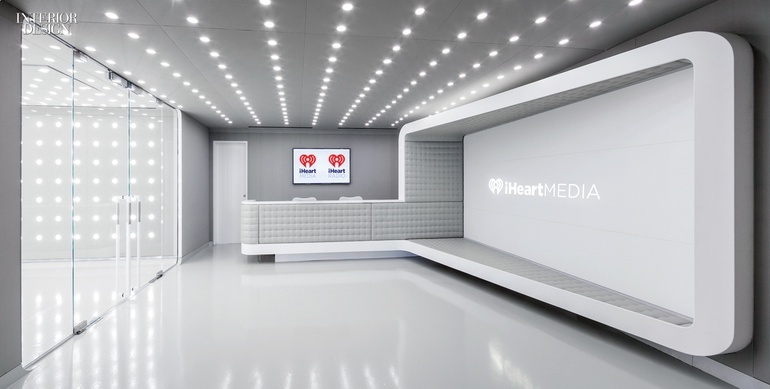 In IHeartMedia CEO Robert Pittman’s fantasy, clients would walk into the company’s New York headquarters and ask “Who are these people?” Pittman commissioned Beneville Studios, who then selected Brad Zizmor and Dag Folger of Architecture + Information, to get the job done. The project’s masterpiece is the interactive entry sequence—magically projected video appears on a curtain of fog that emerges from jets as visitors exit the elevators. 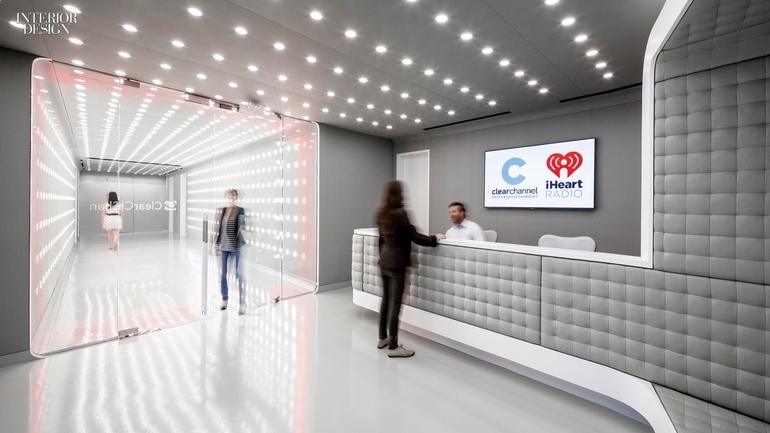 Striding toward reception, visitors serve as a tuning dial that trips invisible infrared beams and instructs the sidewalls’ vertical rows of white LEDs to shift temporarily to red, with hidden speakers playing successive channels of streaming live audio sourced from IHeartRadio stations.